Where would you business be without your customers? Likely out of business, right? 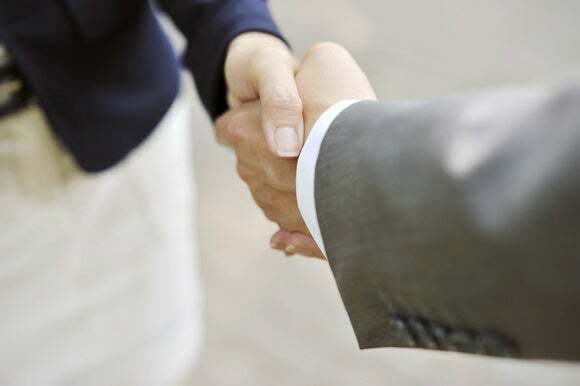 Managing your clients and finding and engaging potential new clients is vital to keeping a business running. That's why a proper CRM solution is a must. Here are three CRM apps that take different paths to managing customer relations. Zoho CRM lets you see where your contacts are. CRM is just one of the apps available from Zoho, a company that was an early entrant in the market for Web-based office suites. What’s especially nice about Zoho is that the company has continued to offer free versions of its app that are full-featured–something that many of its competitors has abandoned as the popularity of Web-based apps has surged in recent years. Zoho CRM is no exception: This app is available for free for up to 10 users, offering leads, accounts, contacts, feeds, documents–and access to its mobile apps for Android and iOS. Those apps are surprisingly robust, too, offering enough features that they can rightfully be considered full-featured CRM tools on their own. They let you view and create records, search records, see your customer’s location in Google Maps, make and log phone calls, and send emails to your leads and contacts. The mobile interface is basic, but easy enough to use once you’ve figured your way around Zoho CRM. The company would do well to add a few introductory videos or tutorials that would make it easier for users to get up to speed quickly; after all, as a free and low-cost app, Zoho CRM is likely to attract novices. I also wish it were easier to create tasks directly from emails, and that the app offered the ability to create more robust reports. Still, Zoho CRM offers a great value for small businesses who need to watch their budget. Insightly's mobile app is neatly designed and easy to use. Insightly also offers a full-featured free version of its popular CRM solution, but it's limited to just two users. That may mean that some businesses who like this product will have to upgrade to one of the paid plans, which, like Zoho’s paid versions, start at $12 per user, per month. There's a lot to like about Insightly, including its mobile version, which runs on Android and iOS. Included with the free version, Insightly’s mobile app offers many of the features you’ll find in its desktop version, including its Project Management features. I like how Insightly ties Project Management in with CRM, allowing you to create and assign projects from within the app. Zoho, which offers its own Project Management tool, would benefit from a similar feature. Insightly’s mobile app looks a whole lot like Zoho’s, though its graphics and overall design are a bit more defined. Its main screen, from which you can choose to manage and create Tasks, Contacts, Organizations, Opportunities, Projects and Emails, appears from the right side of your device. Selecting any of the available options lets you drill down deeper into that topic. Like Zoho CRM, Insightly could be a bit overwhelming at first, though the company’s Web site does offer videos to help you get started. If you’re a very small business looking to get started with CRM–especially if you need integrated Project Management – Insightly is a good choice. 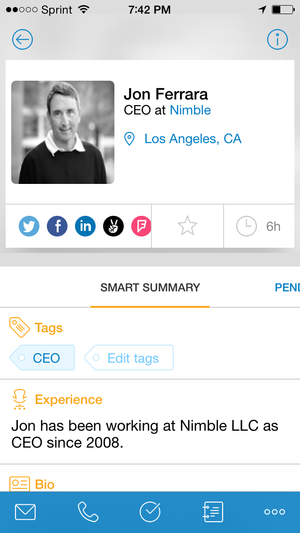 Nimble keeps the focus squarely on your contacts. Nimble’s CRM solution is all about relationships–and today, many of those relationships take place on social media. Nimble focuses on precisely that, bringing information from various social networks together in one central location. Nimble does not offer a free version past its 14-day trial period; after that, you pay $15 per user per month. That’s slightly more expensive than Insightly’s and Zoho’s entry-level paid versions. But anyone who uses social media to conduct business will appreciate Nimble’s bent. It brings in all of the different communications from your contacts–including status updates, tweets, emails, and more–and allows you to see them through the lens of a CRM tool, with features like deals and activities. The mobile app, available for Android and iOS, is well designed and easy to use, allowing you to see Nimble’s Contact Cards for all of your contacts. What it doesn’t offer is the overview that the Web-based app has, where you see a list of engagement opportunities from important contacts, birthdays and job changes, and more. 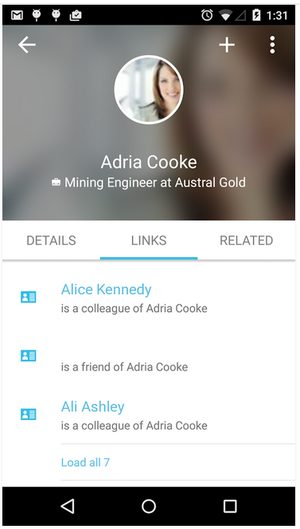 The Web version also shows more useful details about your contacts–shared contacts, for example–that the mobile app lacks. Overall, Nimble is a great tool for managing and engaging with your contacts, especially if you rely on social media for your business. But its mobile app is missing some key features found in its Web-based version.